Solid writing and richly varied subject matter make something special out of this anthology of 28 original stories, produced for the 50th anniversary of the Western Writers of America. 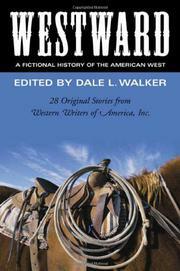 Noting recent momentum toward “more authentic backdrops and more realistic plots and character” in traditional western tales, editor Walker (author of such expert popular histories as Bear Flag Rising, 1999, and Eldorado, 2002) has elicited from his contributors impressive reworkings of familiar material. The Lewis and Clark expeditions, for example, are the subject of Walker’s own “York’s Story” (about the expedition’s lone black member: “ . . . one who journeyed to the Western Sea and saw things no man of my color before me saw.” The Civil War adventures of Confederate troops are depicted in Michelle Black’s accusatory “The Hundred Day Men” and James Reasoner’s blistering “Dead Man’s Hollow”; the siege of the Alamo in John V. Breen’s “A Man Alone”; Custer’s Last Stand and after (as reported by the General’s widow) in Susan K. Salzer’s “Miss Libbie Tells All.” Legendary figures make memorably vivid appearances: Oglala chieftain Crazy Horse (Janet E. Graebner’s “The Whispering”); doomed gunslinger “Doc” Holliday (Arthur Winfield Knight’s superb “The Big Die-Up”); and “mountain man” Jedediah Smith (Win Blevins’s “Melodies the Song Dogs Sing”) and Rocky Mountain trapper Jim Bridger (Richard C. House’s splendid tall tale “Gabe and the Doctor”). A few stylistically undistinguished stories bespeak this hardy genre’s pulp origins. But most are simply, starkly written and several have the heft and tang of classics-to-be: Don Coldsmith’s wistful vignette (“First Horse”), about a young Indian “Dreamer’s” first sighting of an “elk-dog” (i.e., a horse) that prophesies his culture’s altering future; Ivon B. Blum’s fictionalization of a notorious wagon-train massacre spearheaded by Mormon settlers (“Inquest in Zion”); and Richard S. Wheeler’s dazzling reimagining of the life of pseudonymous frontier journalist “Dan DeQuille” (“The Square Reporter”). A marvelous collection that can only help make reading westerns respectable once again.